the diverse world of contemporary American poetry with readings by poets, interviews with critics, and short poetry documentaries. Nothing is off limits, and nobody is taken too seriously. 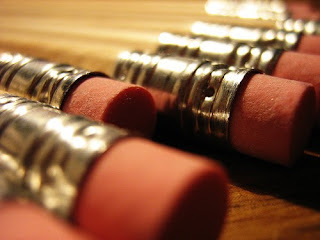 Last week's audio was "Poetry Written with an Eraser." This was my first exposure to erasure poems. You take an existing work of poetry or fiction, or I suppose anything at all, and erase (or white out) sections of it to come up with something that becomes a poem on its own. The part of the process that most puzzled me was how the person doing the erasing decided upon guidelines for removing the words? Yetta Morrison took Joseph Conrad's fictional Heart of Darkness and "excised all things human." She left only references to nature. I thought I'd try an erasure poem myself, so taking an old anthology, I randomly opened the book and found Walt Whitman's "Miracles"
I decided to use Morrison's guidelines and take out anything that had to do with humans, I would leave in words or phrases about nature. I would also take out the punctuation. I rearranged the lines a little, and retitled it, "Miracles." The sky along the beach. Trees in the woods at night. Honey-bees busy around the hive of a summer. Animals feeding in the fields. The sundown stars shining so quiet and bright. The exquisite delicate thin curve of the new moon in spring. Every hour of the light, and dark. The surface of the earth. Every foot of the interior. The motion of the waves. It was a fun exercise! Check out the Poetry Friday Round-Up at Picture Book of the Day. On Wednesday, after two days of snow, the sun rose, the clouds cleared, and the sky was a brilliant blue. It was a lovely way to start my day. I snapped a photo from the library's parking lot. 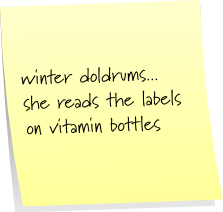 Then, like magic, a haiku popped into my head. After a little editing of both the photo and the haiku, I ended up with the haiga below. Haiga is the combination of image (generally a painting or photo) and haiku (senryu, tanka, cinquain, or other short poem). My haiku buddy, Marnie Brooks, has been experimenting with haiga for a while now (you can see some of her work here). Despite having written haiku/senryu for years, I'm a relative newbie when it comes to haiga. 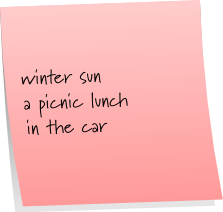 You may notice that I used metaphor in the haiku. 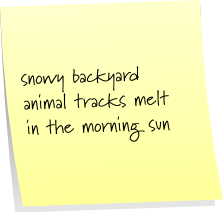 Writers of haiku are generally advised not to use poetic devices. I usually don't, but the color of the sky called out--"Delft." I couldn't get it out of my head, it worked for me, and I think it works for the poem. As Katherine Hepburn said, "If you obey all the rules, you miss all the fun." You can find free photo editing at picnik.com. It's easy to use! I enjoyed working with it and will be going back soon to try adding text to more pictures. Look out haiga world--here I come! Liz Scanlon, author of the recently announced Caldecott honor book, All the World (illustrated by Marla Frazee), is hosting this week's Poetry Friday Round-Up at Liz in Ink. Congratulations Liz! 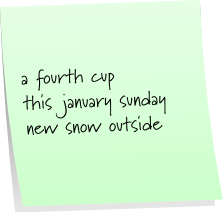 *I also posted this haiga at 4 Seasons Haiku: Winter on Wednesday. 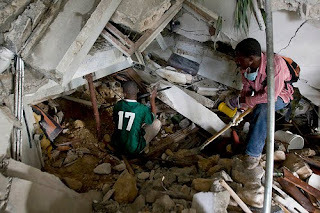 Poetry Friday--"And Death Shall Have No Dominion"
The past few days have been filled with news of the devastating consequences of an earthquake in Haiti. The photos of people dazed and wandering, the piles of rubble that were once homes, the bodies lining the streets, are almost unbearable to view. This has been on my mind and has led me to a a poem by Dylan Thomas. And death shall have no dominion.Read the rest here. I find a bit of consolation in this poem, especially the line, They shall have stars at elbow and foot. Author, Tracy Kidder, wrote about a Boston-based organization, Partners in Health, in his book, Mountains Beyond Mountains. I saw Kidder on television last night, and he urged people to support PIH since it is already at work in Haiti. Being situated a distance from Port-au-Prince, Zanmi Lasante, which is Haitian creole for Partners in Health, was immediately able to start providing aid. If you are able, perhaps you will consider supporting Partners in Health. Visit Great Kid Books for this week's Poetry Friday Round-Up. At work yesterday, there was a flock (meaning dozens) of robins outside the library. Each time the door opened, they'd swoop from one tree to another. Now, this wouldn't be such an odd thing, except that it is JANUARY and this is NEW HAMPSHIRE! Those feathered critters should have flown south long ago. And what made it worse--it was snowing all afternoon. So, I tried to take a few pictures, but I couldn't get too close. The only one in which you could actually see a few of the birds is below. I wrote a little poem to go with it. 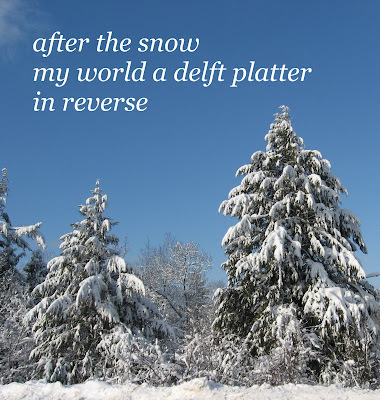 I also wrote a haiku and posted it, and the photo, at 4 seasons haiku. not fly south for the winter? I apologize for the quality of the photo. It was already after 4, getting dark, and my lens was covered with melting snowflakes, thus the whitish spots. Once again I turn to Robert Frost who is New Hampshire's poet. Here's one of his seasonal poems called "Good Hours," which is perfect for today. 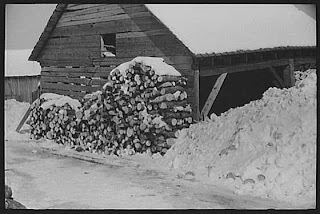 New Hampshire is covered with a thin layer of crusty snow, it is cold, damp, and if I were to walk out tonight at 10:00, I, too, would probably see "no window but was black." Visit Tricia at The Miss Rumphius Effect for the Poetry Friday Round-Up. Have a great weekend! Picture book writers take note. The days of a book in hand, the waft of paper and ink, may be nearing its end. This is the future. Will it change the way we tell a story? We'll soon find out. It seems that in Japan, on New Year's day, people typically exchange greetings with friends and loved ones. This exchange is called a nengajyou. 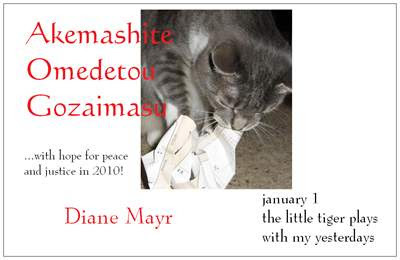 A card or postcard should include the jyunishi (zodiac sign) for 2010, the Year of The Tiger. Somewhere on the card should appear the words, Akemashite Omedetou Gozaimasu (Happy New Year). An original haiku with a New Year's theme should be included. Each person on the list should be mailed a card so that it will arrive by New Year's day. I took a little liberty with my jyunishi--I have a "tiger" living in my house and I included her picture. I've received many, many greetings thus far. All are wonderful! All are greatly appreciated! Mary Lee is hosting the Poetry Friday Round-Up at A Year of Reading.